When considering facial plastic surgery — or any other kind of aesthetic enhancement — finding a qualified, experienced doctor is one of the most important decisions you will make. In Evans, just outside Augusta, GA, Dr. Achih H. Chen, is a double board-certified facial plastic surgeon serving metro Atlanta, GA, Augusta, GA, Charleston, SC, and Columbia, SC. He has spent his career perfecting the skills he uses in facial plastic surgery. Prior to his arrival in the Central Savannah River Area, Dr. Chen performed facial cosmetic enhancement procedures in Beverly Hills, California – an area known the world over for the quality and quantity of its plastic surgery. Dr. Chen is committed to achieving your goals with safe, compassionate care that produces beautiful, natural-looking results. Dr. Achih H. Chen is director of the Georgia Center for Facial Plastic Surgery in Evans, GA. Dr. Chen was recruited to Augusta by the Augusta University, where he also served as Director of the Division of Facial Plastic Surgery. In his capacity as a Division Director and has been entrusted with training some of the brightest facial plastic surgeons of the next generation. In addition, he is one of only a select few physicians in his field chosen to be a member of the Task Force for New Materials to develop new written examination questions for American Board of Medical Specialties. 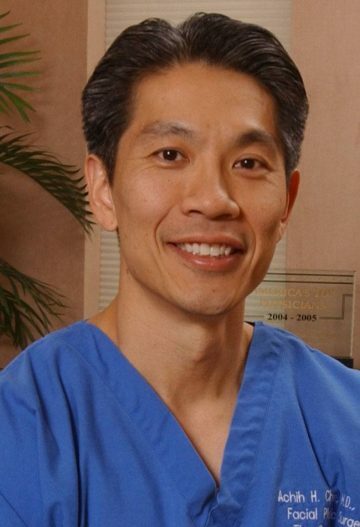 Dr. Chen is a member of the editorial board of the medical journal Annals of Otology, Rhinology and Laryngology and has met the rigorous requirements to be selected Fellow of the American College of Surgeons, Fellow of the American Academy of Facial Plastic and Reconstructive Surgery, and Fellow of the American Academy of Cosmetic Surgery. Dr. Chen holds dual board certification by the American Board of Facial Plastic and Reconstructive Surgery and the American Board of Otolaryngology-Head and Neck Surgery. He has published more than 24 articles in peer-reviewed medical journals and has co-authored four book chapters. He has received the prestigious Castle Connolly Top Doctors® Award, an award distinguishing the top 1% of physicians in America. He has also been selected by his fellow physicians as one of the “Best Doctors in America” for 9 consecutive years from 2007 to 2017. The award is given to the top 5% of physicians in the United States. He has also been distinguished as one of “America’s Top Physicians” each year from 2005 to 2017 and as one of “America’s Top Plastic Surgeons” each year from 2006 to 2017 by the Washington, D.C.-based Consumer’s Research Council of America. Additionally, he has been featured on the nationally syndicated show, The Doctors, showcasing his leading edge facial rejuvenation technique, The Total Face®. Dr. Achih H. Chen grew up in the Midwest. He attended college at the University of Iowa, where he received a Bachelor of Science degree in Physics with a minor in Mathematics. Dr. Chen was awarded High Distinction for graduating in the top 5% of his class. He completed his medical training at the University of Iowa College of Medicine, receiving the McCabe Research Award for his investigation into the molecular basis for hearing loss. After graduation, Dr. Chen was recruited to the prestigious residency program in Otolaryngology-Head and Neck Surgery at the University of Iowa, a perennial top-5 program as ranked by the U.S. News and World Report. He completed a National Institutes of Health post-doctoral research fellowship during his residency and was named Chief Resident. After the completion of his residency, Dr. Chen was selected from a nationwide pool of top applicants to complete his subspecialty training in facial plastic and reconstructive surgery at the world-renowned Lasky Clinic in Beverly Hills, best known for its celebrity clientele. The skills and talents that Dr. Chen brings from his experience treating celebrity patients in Beverly Hills distinguish the cosmetic procedures that he performs. A.H. Chen and A. Becker. Total Face Rejuvenation: Simultaneous 3-Plane Surgical Approach Combined With Ablative Laser Resurfacing. American Journal of Cosmetic Surgery. 31(3):183-188, 2014. T.R. Hester Jr., Z.E. Gerut, J.R. Shire, D.B. Nguyen, A.H. Chen, J.B. Diamond, J.C. Desmond, L Silvati-Fidell, S.V. Abrams. Exploratory, Randomized, Controlled, Phase 2 Study to Evaluate the Safety and Efficacy of Adjuvant Fibrin Sealant VH S/D 4 S-Apr (ARTISS) in Patients Undergoing Rhytidectomy. Aesthetic Surgery Journal. 33: 3: 323-333, 2013. T.R. Hester Jr, J.R. Shire, D.B. Nguyen, Z.E. Gerut, A.H. Chen, J.B.Diamond, J.C.Desmond, L. Silvati-Fidell, S.V. Abrams, R.J. Rohrich. Randomized, Controlled, Phase 3 Study to Evaluate the Safety and Efficacy of Fibrin Sealant VH S/D 4 s-apr (Artiss) to Improve Tissue Adherence in Subjects Undergoing Rhytidectomy. Aesthetic Surgery Journal. 33: 4: 487-496, 2013. P. Young, M. Fisher, J. Segel, F. Stucker, A. Becker, A.H. Chen. Treatment of Large Keloids with Secondary-Intention Healing. American Journal of Cosmetic Surgery. 30(3):193-199, 2013. H. Perakis, J.P. Champagne, N. Bhatt, Achih H. Chen. A comparison in tensile strength between barbed suture and monofilament suture for SMAS imbrication during rhytidectomy (facelift). Fall Meeting of the American Academy of Facial Plastic and Reconstructive Surgery, San Francisco 2011. N. Bhatt, H. Perakis, J.P. Champagne, J.B. Diamond, Achih H. Chen. The role of midfacial implant augmentation in the aging face. Fall Meeting of the American Academy of Facial Plastic and Reconstructive Surgery, San Francisco 2011. J.P. Champagne, H. Perakis, N. Bhatt, Achih H. Chen. Dimpleplasty: A series of twenty consecutive procedures. Fall Meeting of the American Academy of Facial Plastic and Reconstructive Surgery, San Francisco 2011. Achih H. Chen, W.H. Moretz III, H. Perakis, J.P. Champagne, A. Markarian, F.M. Kamer. Medial crural suture technique: long term columellar narrowing and extrapolated effect on tip projection and rotation. American Journal of Cosmetic Surgery. 27(3):107-114, 2010. N. Bhatt, H. Perakis, P. Weinberger, C. Gourin, K. Iverson, Achih H. Chen. Low hyoid and obtuse cervicomental angle: addressing the difficult neck during rhytidectomy with hyoid release. Fall Meeting of the American Academy of Facial Plastic and Reconstructive Surgery, Boston 2010. H. Perakis, M. Johnson, Achih H. Chen. Facial structures can predict personality traits. Fall Meeting of the American Academy of Facial Plastic and Reconstructive Surgery, Boston 2010. K. Iverson, J.D. Prosser, N. Bhatt, Achih H. Chen. Mandible repair using intermaxillary fixation screws. Fall Meeting of the American Academy of Facial Plastic and Reconstructive Surgery, Boston 2010. A.H. Chen, H. Perakis. Mini-but effective: mini-lift under local anesthesia with composite flap dissection. Fall Meeting of the American Academy of Facial Plastic and Reconstructive Surgery, San Diego 2009. H. Perakis and Achih H. Chen. Calcium hydroxyapatite injection for mid-face rejuvenation. Fall Meeting of the American Academy of Facial Plastic and Reconstructive Surgery, San Diego 2009. Dr. Chen offers an array of aesthetic enhancement procedures, including endoscopic forehead (brow) lift, facelift, BOTOX® Cosmetic, and laser skin resurfacing, that can rejuvenate your face and reduce the signs of age. Contact our cosmetic surgery facility and arrange a consultation with Achih H. Chen, M.D. today. Also, be sure to visit him on Google+. If you are located out of town, our patient coordinators at The Georgia Center for Facial Plastic Surgery are happy to assist you with lodging and travel arrangements. Copyright © 2019 The Georgia Center for Facial Plastic Surgery. All rights reserved. Dr. Achih H. Chen is a double board-certified facial plastic surgeon at The Georgia Center, where he offers state-of-the art surgical and nonsurgical facial rejuvenation procedures, including the Total Facelift, upper and lower eyelid surgery (blepharoplasty), rhinoplasty, laser skin treatments, and BOTOX® Cosmetic and dermal filler injections. His Evans, Georgia practice serves Augusta, Columbia and Charleston, South Carolina, and the Atlanta metro region.